Three in 10 Britons go at least one day a week without speaking to anyone close to them, according to new research published today which sheds light on the UK’s loneliness epidemic. With almost two-thirds (63 per cent) of people also admitting they at least sometimes feel lonely, the poll highlights the isolation that millions of Britons experience, as changes to lifestyles and working patterns erode the opportunities for daily face-to-face contact. The problem of loneliness is particularly acute among younger people, with 83 per cent admitting they are affected, compared to 46 per cent of those aged over 65. The poll, conducted by ComRes on behalf of Greener Journeys, comes only weeks before the Government is expected to launch its Loneliness Strategy to tackle the growing problem of isolation felt by Britons up and down the country. The strategy, announced in January, is expected to include policies to combat the loneliness epidemic caused by a range of factors, including rising old age, a change in work patterns and the growing use of technology which allows people to work from home. A third (33 per cent) of Britons admit that they deliberately catch the bus to have some human contact, whilst for some, a bus driver, barista, post worker or store attendant might typically be the person someone speaks to in a day where they do not speak with someone close to them. Of the 2,000 polled, almost half (48 per cent) said they have gone at least one day without speaking to a friend, family member, work colleague or carer in person. Of those in this group, 39 per cent said it was because they didn’t leave the house; 24 per cent said it was because they live alone; and 22 per cent said it was because no one tried to talk to them. Almost one in five say they can wait for a week before speaking to anyone and almost one in 10 (7 per cent) will wait for a month without a conversation. Greener Journeys, the sustainable transport group, said the findings highlighted the crucial role that buses play in facilitating social interactions and supporting local communities. Previous research for Greener Journeys has shown that local bus services are particularly vital to some social groups, such as the elderly and young, providing access to social activities and essential services, and improving the general health and well-being of individuals. Two thirds of bus users have said that bus creates strong community ties, and 8 out of 10 know someone who depends on the bus. 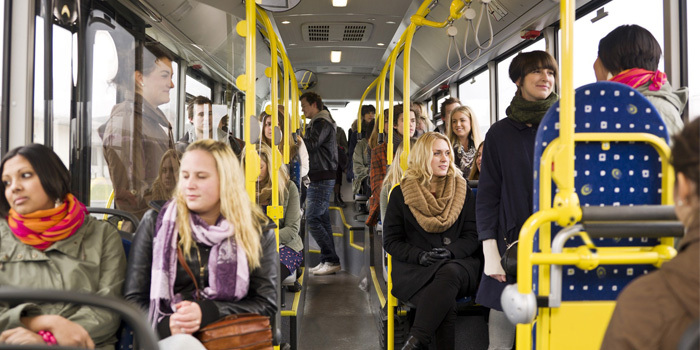 Bus travel helps people to be more sociable, with 37 per cent of bus users saying while travelling by bus they talk to people they’ve just met. “These new findings show just how widespread the problem of loneliness has become in Britain. They also show how dependent some people are on the bus for everyday human contact. This is just more evidence of how essential buses are to the fabric of UK society, and why it is crucial that buses get the funding they need to safeguard their future and support millions of vulnerable people. “With the Government due to publish its strategy on loneliness later this month, this research demonstrates that for real change to be achieved, clear and practical commitments on issues such as public transport need to be made by Government departments. Without these commitments, we won’t see the progress on loneliness we need. Decisions made at a national level will make the difference between people being connected with friends and family, or going for weeks on end without seeing anyone. ComRes interviewed 2,002 British adults online between 19th – 20th September 2018. Data are weighted to be demographically representative of all UK adults aged 18+. ComRes is a member of the British Polling Council and abides by its rules.